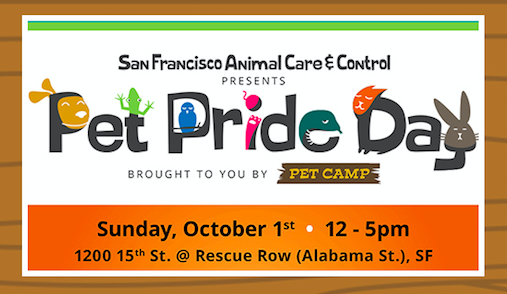 Pet Camp is presenting Pet Pride Day to support our friends at San Francisco Animal Care and Control. Come on over to Rescue Road, right outside ACC (that’s 1200 15th Street if you’re GPS inclined), say hi to us but more importantly support the work of San Francisco Animal Care and Control. Pet Pride Day goes from noon to 5:00. RSVP on Eventbrite and show your RSVP at the raffle table to get a free raffle ticket (must be present to win). Additional tickets are $5 or 5/$20 and all proceeds go directly toward helping the animals through ACC’s supporting nonprofit organization: Friends of SFACC.